CCP has released a number of interesting announcements in the patch notes yesterday, however, as usual, they may have underestimated the customer response to the changes they are making. The Patch Notes contain a mixed bag of good and bad depending on who you are and what you do in EVE. I’ll address some of the highlights and controversies. Audio was mentioned first. This is the first time this writer has been informed there is sound in EVE. Who knew? After the odd increase in costs for contracts last patch, CCP has lengthened the duration to 4 weeks. Fighters and Drones get some love this month. Their abilities can be deactivated by clicking on the icon below the locked target. If done well the visual used for drone health will go a long way to help players manage fighters more effectively. 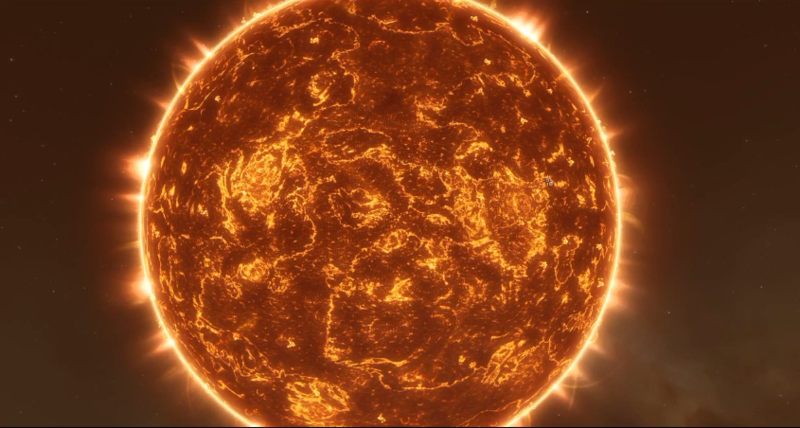 The new Sun visuals arrive! Sometimes you have to sit back with the Chai Latte and just enjoy how amazing the universe CCP created is. Found in Delve, Querious and Period Basis the new missions that drop the new BPCs for the Dragon, Chemosh and Molok. You will not find them immediately since they need some time to build the Sotiyio. They will begin to be available on 5/11. This is the most significant change of the patch. It will be interesting to see how the loot from these sites is managed by the groups in these regions. Due to the challenge represented we will see if they drive any 3rd party content. This is a change that has more impact than originally anticipated. All PLEX are converted to micro-PLEX at a ratio of 500 micro-PLEX for each PLEX. With this change, aurum goes away and is also converted to micro-PLEX if you had a balance over 1000 Aurum. Lessor balances will be converted later. A PLEX-Vault is also added that makes it available to any character on the account and is safe from destruction. This can’t be said enough. There is no reason to have micro-PLEX in your cargo hold. One of the more controversial aspects of the PLEX change is that PLEX will no longer be able to be used for character transfers. You can read the Reddit thread here. You will now be required to pay in cash to transfer characters. A “technical issue” appears to indicate it is not a regulatory issue with the realisation and conversion of Aurum and PLEX to micro-PLEX. I would guess CCP failed or never intended to write an interface in the new code base to whatever is required to interface with this functionality. From a coding perspective, very little is impossible from a technical view. The possibility to interface new code to old systems is nothing more than time and money. CCP must have made the decision that the value proposition was not there. Then again…maybe they just forgot? The last bullet point seems odd since most people who have station BPOs likely already have the new BPOs. Why do a conversion rather than isk refund? The Fortizar and Azbel BPOs are worth significantly more by NPC value and are losing feature functionality with the release of refineries, as is the Astrahus. The whole convert to new BPOs that have been out for a significant period of time rather than refund seems like CCP re-arranged some timelines but failed to adjust the compensation to make sense. FanFest 2017 promo ships will be added. The list of Defects fixed was 4 scrolls on my mouse wheel. There is good and bad there. Good that they are getting fixed. Bad that there appear to be so many making it through QA. CCP is gearing up for major changes down the line with this patch and the next. There is a lot of good new additions here. Many will challenge some of the decisions and changes associated with this patch. You can read the full set of Patch Notes here. The removal of PLEX from character transfers took everyone by surprise, and seems likely to put an end to a lot of character trading and transfer, after all, do people really want to pay $$ to consolidate their accounts? Character Trading is already largely replaced by injectors, maybe this is the thing that will finally kill it off. Thanks for the walkthrough Erick.